Home » Tools and Décor » Fertilizers » Roses Alive!™ 3 lb. Roses need a lot of food. So if your soil is a little lacking, introducing the right nutrients can completely change the sort of rose show you can expect. We partnered with Gardens Alive!, well known for their all-natural fertilizers, to bring you the best possible formula for your new and established roses. Gardens Alive! specially developed this in their test gardens, to benefit the micro-organisms in soil so that the soil would be healthier and all the plants growing in it, too. 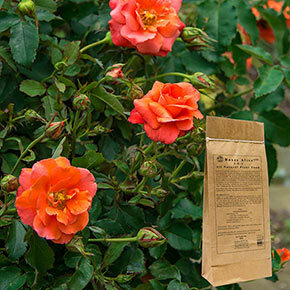 This slow-release fertilizer has high levels of phosphorus, which roses require to produce those big, striking blooms. It also promotes a better root system. Simply apply it once before the blooming period in both spring and fall. As temperatures warm and moisture becomes available, your roses will start needing more nutrients. At that time, Roses Alive! 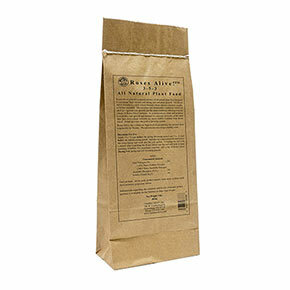 will enrich your soil with those nutrients, naturally right on time.